Over 100 volunteers turned out, and they finished with a haul of 80 bags. So says Bettina Maidment, founder of Plastic Free Hackney, who is on a mission to rid the borough, and her home, of single-use plastics. 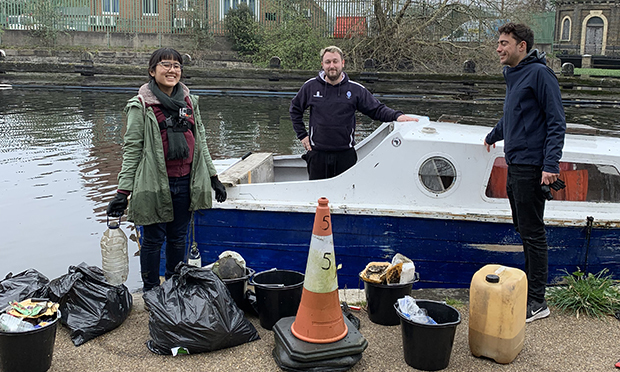 Last Sunday, Bettina and 120 volunteers gathered on the banks of the River Lea to get involved in the Big Spring Beach Clean, coordinated by conservation charity Surfers Against Sewage, which is taking place from 6-14 April. “We are getting involved in a nationwide clean-up that’s happening across the country,” says Bettina. “This year it was titled ‘From Summit to Sea’, a clean-up that tackles all waterways that bring plastic to our seas. “The River Lea feeds to the Thames which then feeds into the sea. Local councillors, businesses, children, grandparents, and their dogs all joined Bettina to collect more than 80 bags of rubbish in two hours. A recent report by the Earthwatch Institute revealed that plastic bags make up only one per cent of trash in waterways, and Bettina tells the Citizen that this is in part due to the government’s initiative to charge people for them. She says the bulk of the litter collected on Sunday was plastic bottles and cans. She thinks it is important for the government’s plans for a deposit return scheme to come into effect as soon as possible to tackle the 13 billion plastic bottles consumed every year in the UK. “It is so important that it is not watered down by all the lobby groups and drink manufacturers because they are pushing to include only small bottles but when we do our clean-ups we also find big bottles. On Plastic Free Hackney’s website, Bettina describes herself as “a married mother of two boys, living a ‘normal’ life in Hackney”. She has not yet reached her goal of reducing her plastic waste to “fill a mason jar” but says that ridding one’s life of plastic requires time and patience. “Don’t feel disheartened if it doesn’t happen straight away, otherwise you will lose motivation,” she says. For people who want to go plastic-free, her advice is to start by looking at what kind of items you’re throwing away the most. “Once you separate your recycling, you realise what you are wasting the most of and can then identify how you can reduce that waste,” she explains. “Carry a tote bag, buy a stainless steel water bottle, use a re-usable coffee cup, say no to straws. These are all the little things that make a difference. 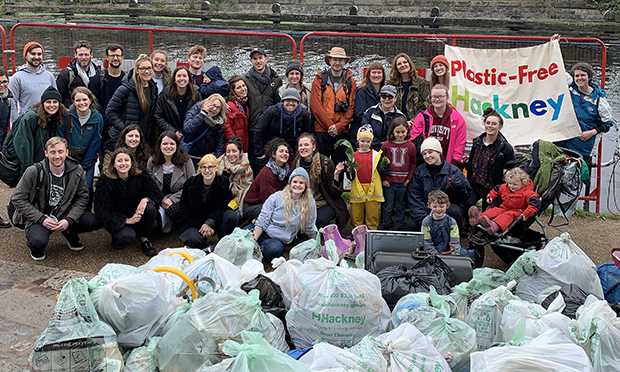 Plastic Free Hackney organise litter picks at the end of every month and is looking for volunteers to create ‘micro-communities’ to campaign more locally within Hackney to convince businesses to go plastic-free.